Scrolling through pictures on Facebook, I came across the picture on the left. I was about 27 weeks pregnancy with Navy. I saved it with November 16th coming up. The picture on the right is Navy. Happy. Healthy. He’s an energetic little guy who is trying to test his limits and my patience. 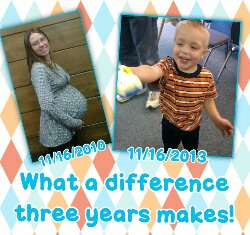 I cannot believe how much my life has changed in 3 years!